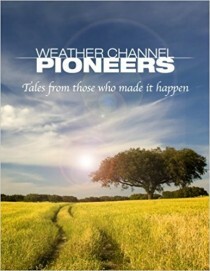 The Weather Channel’s case for global warming courtesy of the climate clowns at climate central and the ‘comedy’? company formerly known as TWC/WSI/Wunderground now under the tailfeathers of MSNBC. Jack Webb in the old show Dragnet had among his memorable saying “Just the fact ma’am”. Thats what we will do. 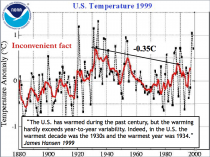 The alarmists ignore the inconvenient facts and instead call to authority - the bogus 97% consensus. Seriously, you may have heard that The Weather Channel/WSI/Wunderground/Weather Central all under the NBC Universal umbrella and are teaming with Climate Central (remember Heidi Cullen) will be promoting global warming alarmist and hyping every weather event as if we never had a heat wave, cold wave, snowstorm, hurricane, forest fire, tornado outbreak before the greenhouse theory was adopted by environmentalists and politicians and, who spent $100B to bribe scientists to support their theory and for useful idiots in the media like those at the NBC Universal family to carry the water which they gladly do, never questioning them like good journalists used to do. 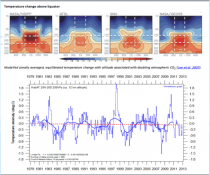 Climate Central and Heidi Cullen, formerly with TWC is feeding her tall tales to TV broadcasters on WSI and Weather Central systems for daily graphics that the TV mets can use to indoctrinate the audience, I thought I would once a week provide some other facts they would like to ignore. 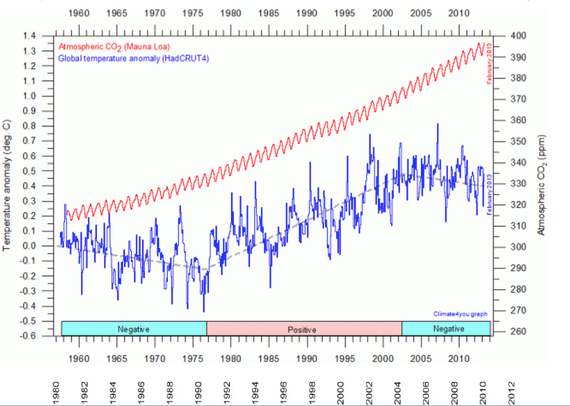 First temperatures have stopped warming in all the data bases going back as far as 1997. 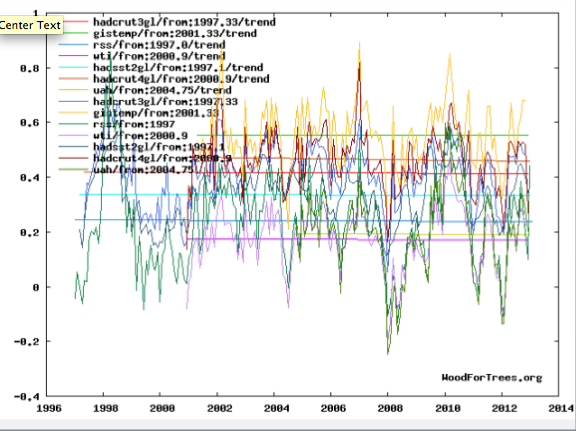 All are showing a cooling since 2002 even as CO2 continues to rise. This is true even though CO2 has continued to rise. This happened before from the 1940s to late 1970s during the post war boom. 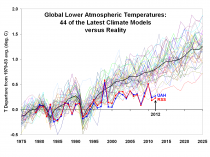 This is in sharp contrast to what the climate models have predicted. One of the strongest signature of greenhouse theory in all the climate model is a hot spot in the tropics peaking at higher levels. That is not seen in either the weather balloons and satellite data. 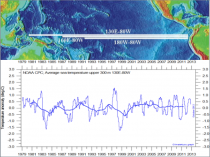 Tropical oceans are supposed to be warming too. 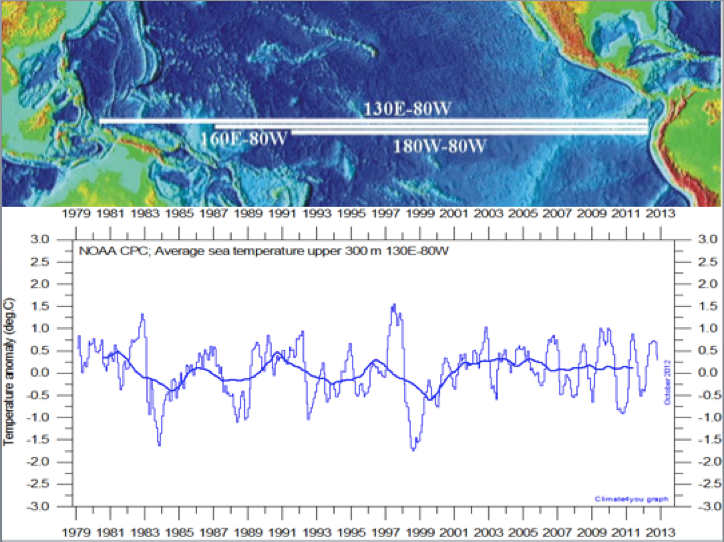 But with excellent buoy data across the Pacific to monitor ENSO, we see no warming back to 1979 down to 300 meters in the tropical ocean (130E to 80W). 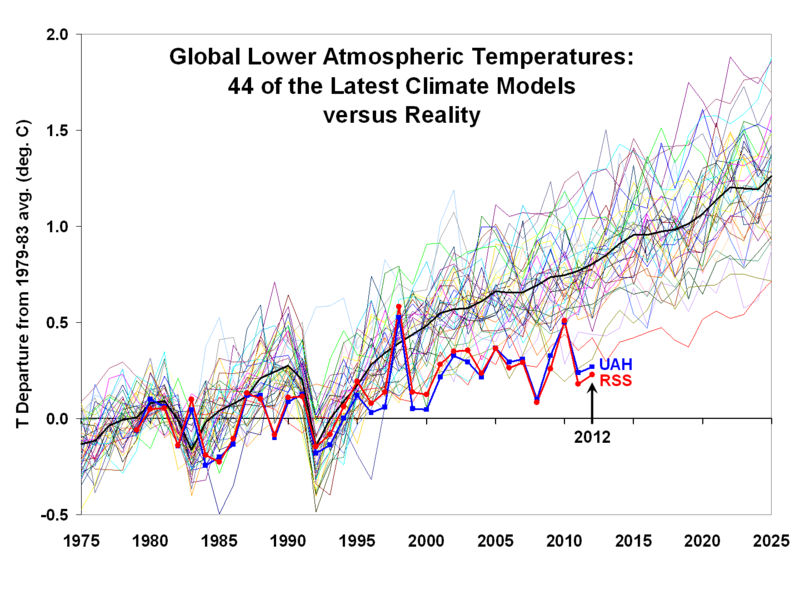 “Kevin Trenberth, a climate scientist at the National Center for Atmospheric Research in Boulder, Colorado, says that it could be a decade or more before this research really begins to pay off in terms of predictive power, and even then climate scientists will be limited in what they can say about the future.” Once again, modelers attempt to explain away their failures due to the dubious excuse of Trenberth’s “missing heat” sinking undetected to the bottom of the ocean. There was a lot of buzz with the hot summer last year when ocean temperatures reinforced ridging over the drought stricken central producing a heat ridge and very warm weather in March and July. 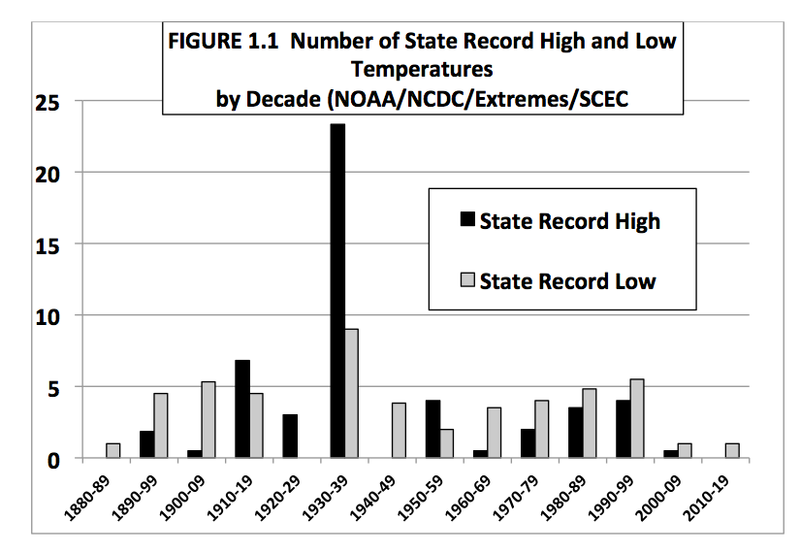 But as Dr. John Christy showed in Senate testimony last summer, no state all-time records were set and the 1930s still dominates. As for individual station records, there are many coop and stations with short history, which would add to the number of highest ever. John Christy also showed, if you focus only on stations with 80+ years of record that went back to the hot 1930s and 1950s, last year was just a blip. 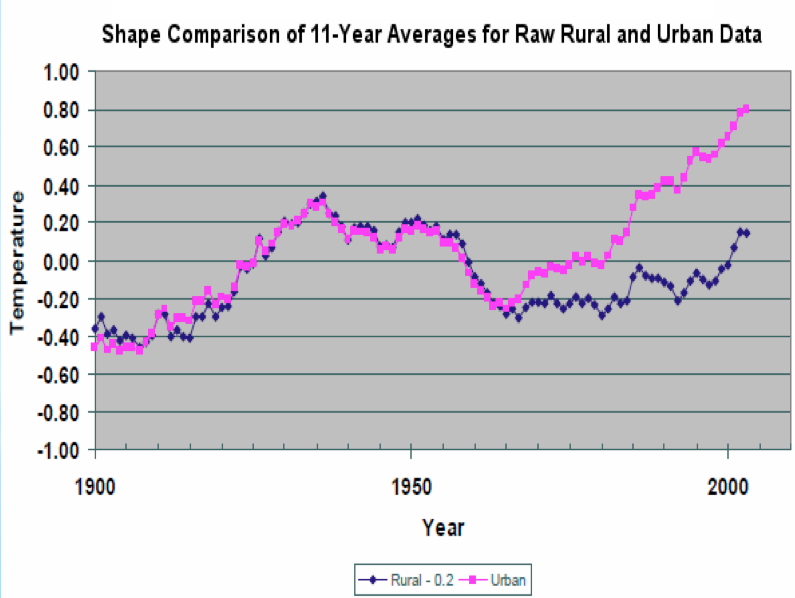 The 1930s was suppressed in the altered global data sets by adjustments made in the 2000s. 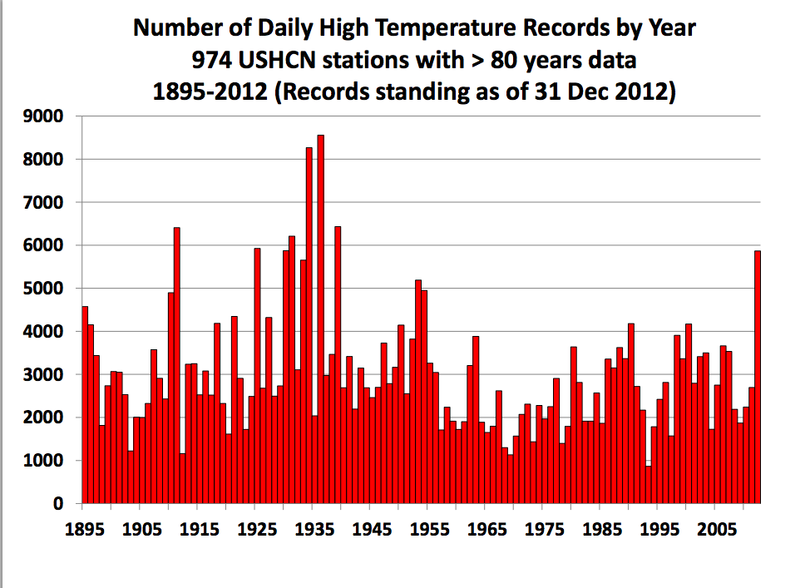 They did not adjust records, just monthly and annual averages. 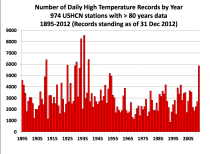 The records show the true trend better than the computed global average surface temperature. 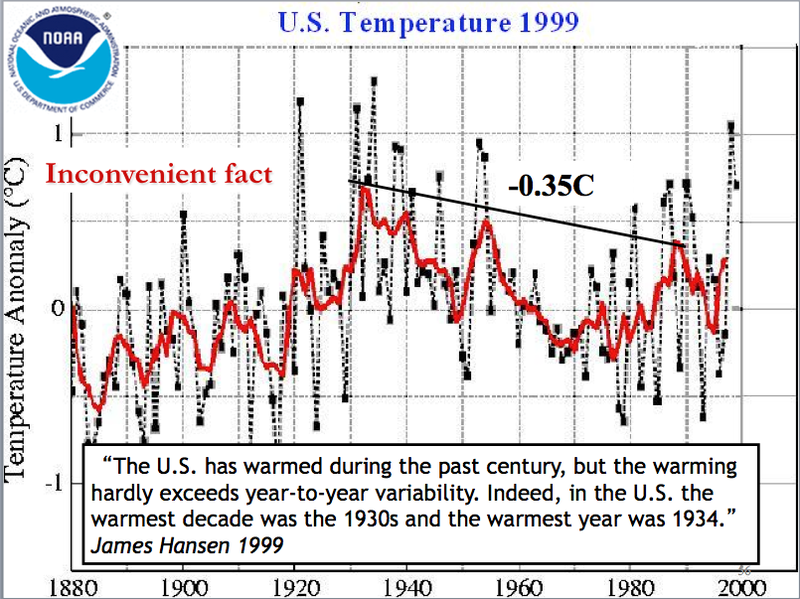 Back in 1934 the US data was as depicted below with an interesting factual comment from James Hansen. 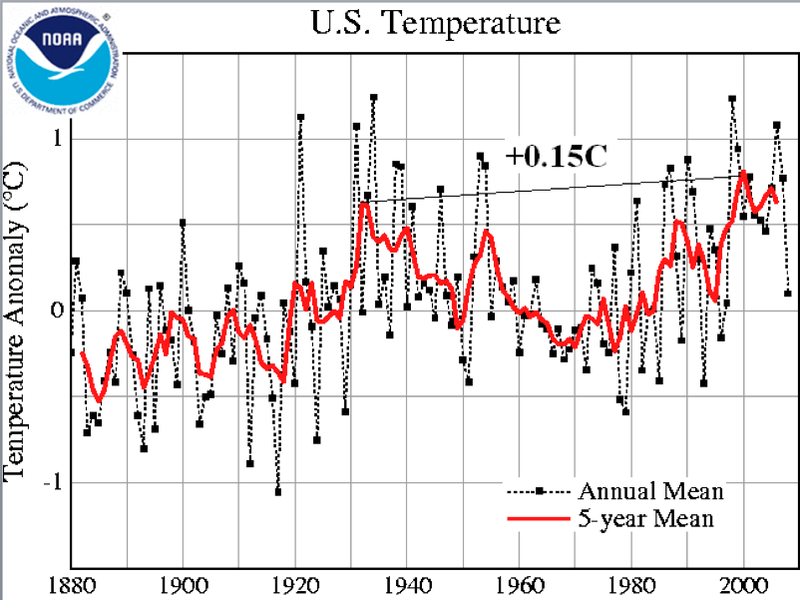 Note how 1998 was 0.3C (0.5F) cooler than 1934. 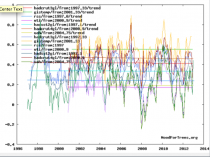 This presented a dilemma for the global warming community because the US lacking of warming was in sharp contrast with the global. 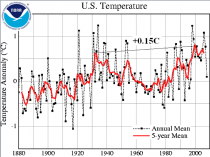 The secret was the US had an adjustment for Urban Heat Island in the US that was not done for the global. 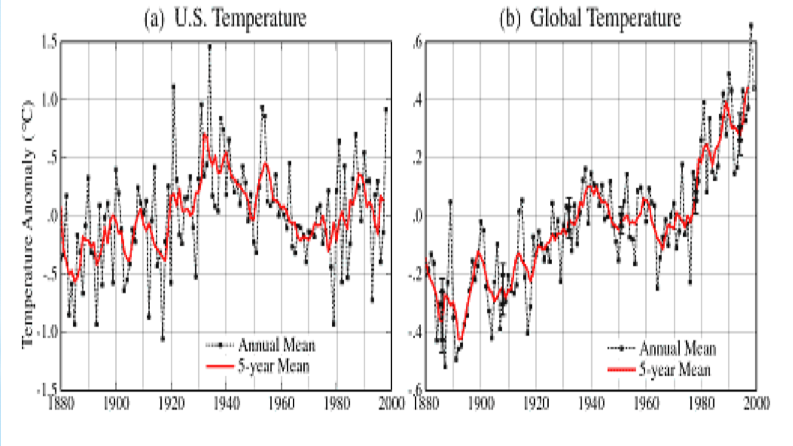 Around 2007, NOAA removed the UHI adjustment for US data so that a warming could be shown. Notice how this brought 1998 up to the level of 1998. 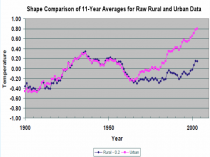 Dr. Edward Long had shown the difference between true rural and urban temperatures for the lower 48 states. We will talk about the UHI and bad siting contamination, no trends in extremes (except winter hemispheric snows) and the other theory failures in upcoming posts. We will show how natural factors can explain all the decadal and longer term changes and the changing frequency of the various extremes. The two events that ‘appear’ to agree with prediction are increased Atlantic Basin hurricanes and decreasing arctic ice. But these are due to natural factors - as Joe Bastardi and I have written over the years, the hurricanes are increasing in line with forecasts in 1995 by Bill Gray when the warm AMO mode returned. When the AMO was positive before from the 1930s to 1960 we had 8 major east coast landfalls. 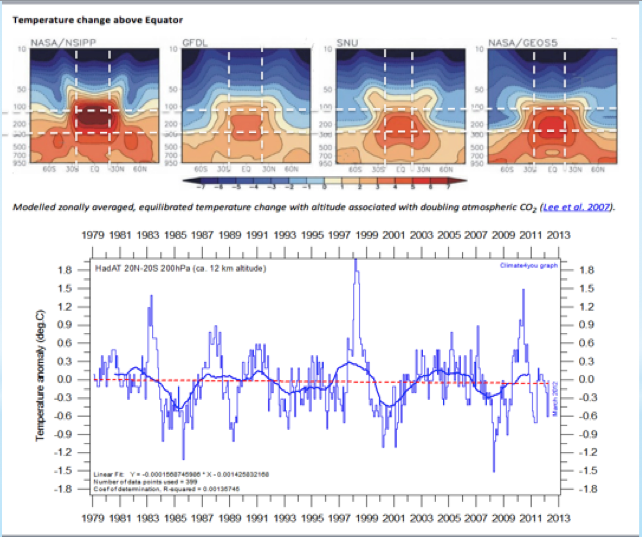 Also the warm AMO and PDO are what drive arctic ice changes and arctic temperatures as IARC UAF has shown and I have published in 2012. We will discuss that too.